We are trained specialists in hair extensions, offering stunning voluminous results with both short and long term options. It is perfect for gals that want to bring out their glamorous side! Every set is individually custom-made to match each client's hair color, texture, style, length, thickness and head measurements. You will be able to keep the set for other events to come. They are safe to heat, curl, wash and color. 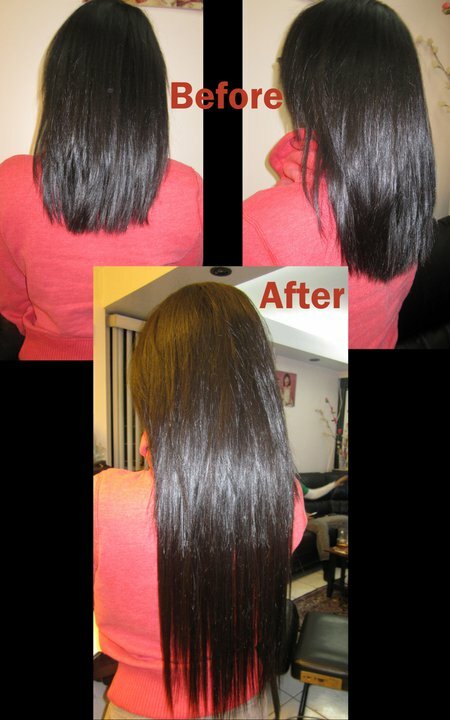 No glue, no clamps, no damage to hair, inexpensive, can be attached and removed in less than five minutes. We design the hair to be strategically placed in different locations on the head, making them virtually undetectable and weightless, creating a perfectly-blended, more luxurious natural look -- even for women with short or fine hair. Each full set of extensions comes with a complimentary extensions loop brush. 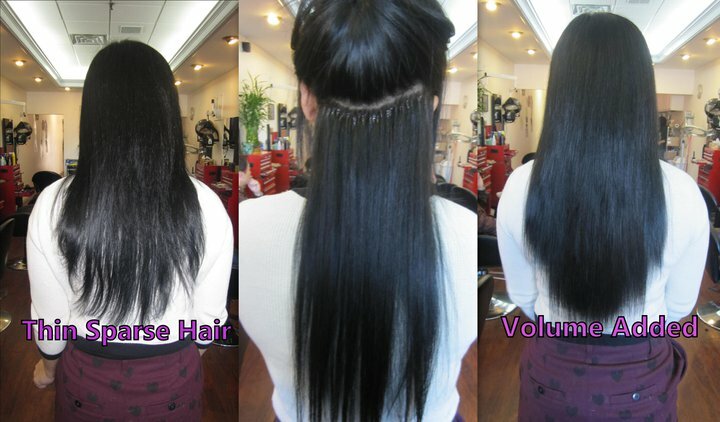 Fusion (I-Tip) Extensions with Remy 100% Human Hair. We can transform your hair with customized volume and length. The hair extensions are attached to small sections of your own natural hair at the root. They are so invisible in each client’s hair because we take extreme care to locate and import the exact match to each individuals needs. Attaching I-Tip extensions is a quick, safe, and comfortable process that does not use any chemicals or damage your natural hair. These methods are done strand by strand, and are the most natural looking. We use 100%, custom located and imported virgin (raw) hair. The purity of the hair allows you to reuse it for over a year. The price quoted at your consultation will be determined by the natural texture, custom color, length of your own hair, length of desired hair, and the amount needed to get your ideal style. Hair is safe to color, cut, and style as you please! Are they obvious or visible? 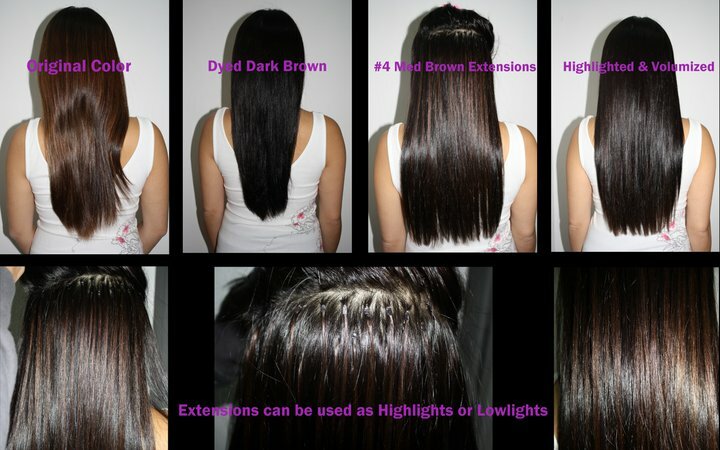 Your extensions will be totally undetectable and we will be able to create an exact match to your own hair. It will look and feel like your own hair. You may even forget that you are even wearing them. You will be able to care for your hair the way you choose. Hot tools are no danger. You can even touch-up your color or relax roots while wearing these real human hair extensions. You will be able to engage in all your normal activities, like swimming, exercising, and dancing, without worrying about damaging your new hair. Remember, these full-cuticle human hair extensions are in as pure a state as is possible for hair to be. Usually we will recommend that your natural hair be at least 3 inches long to cover the tiny attachment pieces. However, during a consultation we will see if your desires and needs exempt you from this. You will be able to go up to 12-16 weeks before any need to schedule a touch up. Each client's hair grows at a different rate. We recommend using a leave-in conditioner spray after your normal shampoo wash and conditioner so that your hair remains extra soft and easy to manage. We would be happy to suggest a few of our favorites to you.